CAN YOU TELL ME HOW YOU STARTED? “I started in the hospitality industry, chef. My parents owned hotels and I have been 38 years now in the business”. Let’s talk whisky, IS IT A HOBBY OR AN INVESTMENT? “Well, it started as a hobby and then the investment side took over. I continue to buy and sell to this day”. WHAT WILL YOU DO WITH THEM IN THE FUTURE? “Probably sell them all, not as a collection, but one by one, maybe at auction. There are just so many in the collection, it might be hard to find one buyer, so I will sell in various lots and bottle by bottle”. Paul; by the way, Ross knows a lot about whisky, the industry and the people in it, this much is obvious. DO YOU HAVE A FAVOURITE? “That’s a hard question. I have a few Mortlach bought from distilleries and auctions, (Paul; like we all do) and maybe a few Macallan are kept hidden away. The collection is still growing and at the moment there are something like 780 bottles there, some duplications of course. I like the old labels, not needing to be the most expensive, just like them to collect”. 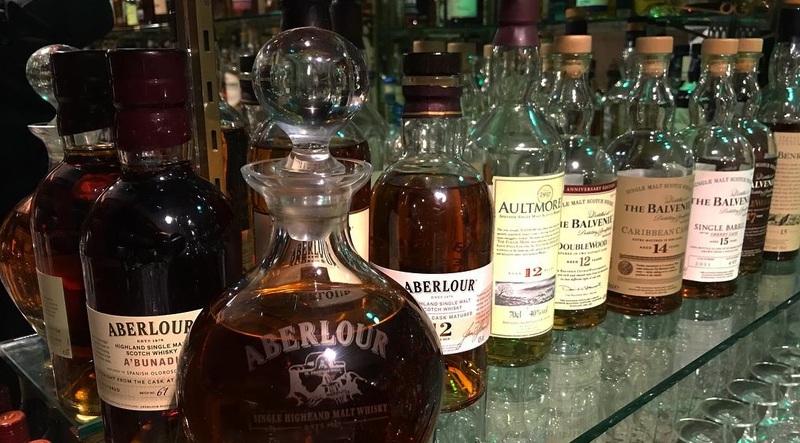 WHAT IS THE MOST EXPENSIVE BOTTLE IN THE COLLECTION? “”Possibly the 1955 or 57 Macallan Lalique. I do have a Mortlach 70 year old, (Paul; you mean the G&M teardrop?) yes. I am also fond of my Glenfarclas collection Scottish Series, I think I am the only person in Europe to have consecutive numbered bottles (only 600 released), the other collection I believe is in Canada”. OK, SORRY TO BRING THIS UP; IF THERE WAS A FIRE, WHICH BOTTLE WOULD SAVE FIRST? He laughs, when he has stopped he says “probably the Macallan’s”. IF YOU HAD A DISTILLERY WHAT TYPE OF WHISKY WOULD YOU MAKE? He dives straight in here “no question about it, sherry finish”. We then have a conversation of the sherry finishes we both like, the brands, the labels etc etc. We both strongly agree on one particular label; Glendronach. In each of the main glass cabinets with whisky on display, there are many wee soldiers knocking about. THE SOLDIERS, WHAT IS THE STORY BEHIND THESE? AS I HAVE SAME AT HOME “An old friend had them, upon his passing he wanted me to have them, they were all in a box mixed up, so to honour him I placed them next to the whisky, there is no military connection with these and whisky at all”. I have looked at these also as many of the same I have at home in my own collection. We chat about hotels in general, tourism, whisky and how we can work together next year on our whisky tours. I have enjoyed this. Many thanks Ross, I am looking forward to being here again many times, ogling the whisky but now knowing much more about the collection. It sure doesn’t help when sitting in Mezzo right next to the whiskies when they are behind glass! As we rise to go back to the bar (we were chatting in the restaurant) he offers me a dram, God’s sake, it’s a triple from his own decanter, he didnee tell me what it was, I have a feeling it could have been a Benromach, it was a beautiful dram. I sat down with my notes, as Ross was wanted by Connie who wanted to be away, he then chatted to four Americans who were staying, and on the whisky. 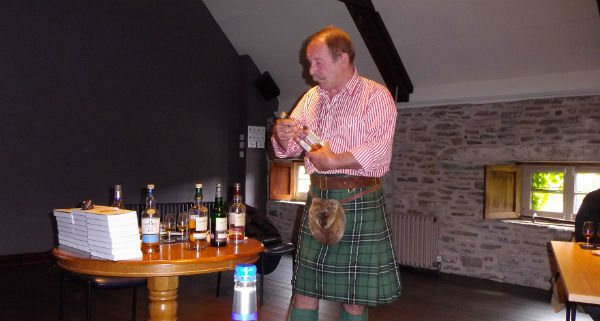 “He’s the man you should talk to” he says pointing at me, “he’s been doing whisky tours over 20 years” – many thanks Ross. So ended my time with Ross, a really nice man, good fun, interesting and another whisky believer! Until the next time slainte!